Sustainable green cleaning practices are rapidly trending upward with facilities maintenance and management teams, building occupants, business owners, and school faculty and administrators, due to its demonstrated ability to cost-effectively increase productivity while decrease costs associated with illness and injury acquired in the workplace. Everywhere you look, green, sustainable business practices are on the rise, and those responsible for implementing and managing the initiatives are not shy about sharing their motivations and success with everyone, as shown by a recent Facility Cleaning Decisions reader survey. 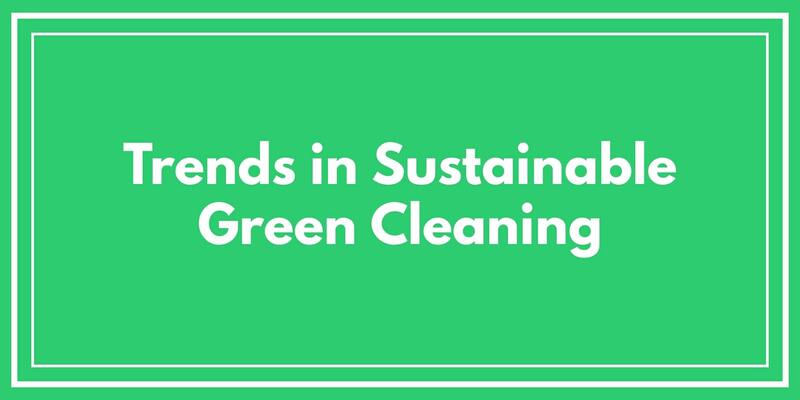 61% felt implementing sustainable practices into their cleaning operations is very important, compared to 45% in 2017. 82% of respondents are putting pressure on their manufacturer and distribution partners to embrace sustainable initiatives in their own processes, which is way up from 64% in 2017. Green cleaning products and equipment, such as biodegradable cleaning chemicals and microfiber, have been on the market for years, and you're likely very familiar with their use and benefits, especially in your home. Engineered Water - Regular tap water that has been treated by either been ozonated, electrolyzed, or treated in some specific way to turn it into a useful cleaning product without the costly chemical manufacturing processes that have severely damaged our food, air, and water supply over the decades. Performance - Green cleaning products and equipment are designed to perform more efficiently, using less product and fewer natural and human resources to accomplish the same cleaning tasks commonly required in schools and businesses. Environmental Awareness - Long story short--no planet, no business or profits, and the consumers of your organization's products and services know this, and aren't afraid to vote for or against your school or company with their patronage. Smart school administrators and business owners realize these factors play a considerable role in their future success and aren't just making the change, but advertising that to prospective students, customers, and employees. We must strive to make better use, and become better stewards of the natural resources available to us. In the United States, these beliefs are held by many of your prospective customers and students who are looking to local schools and businesses to assume a leadership role in environmentally friendly and sustainable cleaning and other business practices. Though the scientific cause and effect of many environmental issues remains debated by some, what is undeniable is a significant consumer interest in environmentally friendly business practices and products. A recent survey found that 88% of Americans believe taking care of the earth is very important - but only 52% believed that the government should be taking action to protect it. Green business can benefit either way: greater consumer interest and/or more protective policy! If you would like to learn more about the advantages of sustainable green cleaning services for your school, or if you would like to schedule a free, no-obligation onsite assessment of your facilities custodial or infection control requirements, contact us today for a free quote!